She flew in to our lives on a Tuesday. April 14, 2009 to be precise. I remember this date because it was the day another veterinary expert examined my horse Lila. Lila had developed a kind of seizure-like condition as if she was being shocked by an electric fence: striking out with her front legs, frantically tossing her head, her eyes wild. She did it outside, inside, in her stall, while grazing, she could get no relief. I consulted with various veterinarians, holistic professionals, and tried different medicines to no avail. On that day, I fetched Lila from her paddock and brought her to her stall for the veterinary examination. To my surprise, standing in the middle of Lila’s stall was a beautiful white bird. It looked like a dove or homing pigeon. I asked the veterinarian to check the bird over and determine if it was injured. The bird seemed fine but wouldn’t fly. The veterinarian walked the seemingly healthy bird down the barn aisle to another stall where it could rest. I put Lila in her stall, sprinkled some grains of sweet feed on the ground for the bird and gave it some water. The veterinarian and I then resumed Lila’s examination. Still unsure of a specific cause for the symptoms, the veterinarian recommended a different steroid and took some head x-rays. I felt nervous but better, happy that we had a new path to pursue. 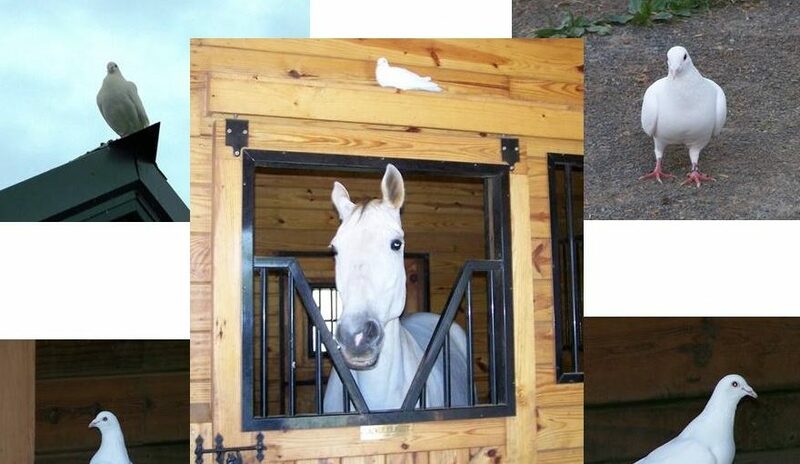 That night, the white bird perched on top of Lila’s stall wall and slept. It was still there in the morning. It seemed to be keeping watch over Lila. I fed it breakfast and changed its water. It flew down easily from its perch, walked down the barn aisle to the stall and ate. It appeared to be able to fly quite well. My husband and I noticed that the bird had a leg band and researched the “national homing pigeon association” website to find out what we should do. According to our research, homing pigeons sometimes roost for 24-48 hours to rest and gather strength for the remainder of their journey. My husband was able to catch the bird and read the band number. He reported the band number to the association. Two days later, we received an email with the name of the person who had purchased the bird band. We called the person and he said he wasn’t sure if it was one of his birds, but that if we caught the bird and put it in a box he would come and pick it up. He was about an hour’s drive away. I had a really strong feeling that this was not a good thing and encouraged my husband to catch the bird “later.” He said no and promptly marched out to the barn with a box and a determined face. After several futile attempts to catch the bird he had easily caught a few days earlier, he gave up and said the bird could leave when it was ready. For some reason, this made me very happy. A few days after Paloma’s arrival, we had a veterinary emergency with one of the horses. He was colicking and needed to be taken to the emergency hospital. With a history of colic including surgery, this was a very serious and potentially life-threatening condition. We loaded him in the trailer and he stayed overnight at the emergency hospital. We were all very scared. The next day, remarkably, he was fine. He did not require surgery and was basically as good as new. We all gave a little nod to Paloma as our good luck charm. For the next month, I conducted my new daily activities: feed the horses, feed the bird, turn out the horses, talk with the bird, go to work. During this time, Lila started to respond to the new medicine and her head x-rays came back negative for any weirdness. I started feeling pretty good and hopeful that she would make a full recovery. Also during this time, other things started to take flight. I began writing articles for the local paper to help people affected by the recession. This pushed me to officially start the company that I had been pondering for several years and develop business cards. The horse that colicked started training better than ever, traveled to a national competition and received the highest dressage award of his career. One of the other horses finally started making visible progress in her recovery from a hard to diagnose metabolic disorder. The whole barn just seemed lighter and the horses were gleaming. One late afternoon after I had turned out the horses and finished the chores, I sat in the grass to relax and watch Paloma eat her dinner outside. She picked up those tiny grains with impressive intensity, speed and accuracy. Never having owned a bird before, this was fascinating for me. The way her head bobbed and her eye periodically scanned the sky for predators held a primal quality. Suddenly, a flock of chattering black birds flew toward us. Paloma stood up straight, looked the birds in the eye and flew off over the barn. She soared high overhead, gaining speed. She raced through the air tracing the perimeter of our property. Flying high above the treeline, she streaked over the indoor arena and suddenly bent her wings and fell into a dive! She swooped up just before hitting the ground and rocketed back up in the air circling our farm. It was shocking how she identified her “territory” so consistently with our property line. At almost dusk, her small white body shined against the blue sky reflecting the fading sun as she jetted through the air. A most spectacular aerial display! Then she was done – she swooped down and flew right through the barn to her favorite perch. I walked into the barn and gazed up at her. She was all puffed up. I said, “Paloma Blanca, that was AWESOME!” There was no mistaking her pride or my appreciation. After a month, one morning I saw another white pigeon. Bigger than Paloma and not banded, he started meeting her for breakfast each morning and she would share the grain. He came diligently for two weeks and sometimes they would fly off together for a few hours but she always returned at night to sleep in the barn. Then one day, six weeks after her arrival, she was gone. She must have finally succumbed to his courtship and flew off to do other pigeon business. I missed her immediately, but also felt like her work with us was done. She had helped us through numerous crises and given us the courage we needed to soar to new heights. And what about Lila? She recovered well, and although she is no longer a riding horse, she is now a senior instructor at our signature equine-assisted coaching program, Alpha Horse Leadership Training for HUMANS™. She’s a master at teaching authentic communication and leadership and clients love her. I will be forever grateful to that little white bird… P.S. Paloma came back later that year and the following year for a visit. In September of 2017, I think she visited once more. 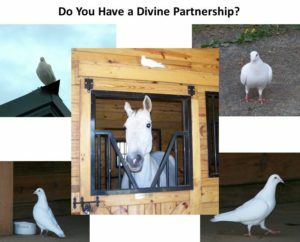 I found a white pigeon in the barn sniffing around the wheelbarrows. I couldn’t believe my eyes. Was it my Paloma? I spoke to the bird. It fluffed up, muttered a few sounds, and then smoothed out. It walked out of the stall and marched down the barn aisleway, as if it knew its way around. It walked into the wash stall and appeared to be looking for its water dish. I followed. It did not fear me at all. I ran to get a water dish and by the time I returned, the bird was gone. She would have been old for a pigeon, but apparently pigeons can live for many years. My heart filled with joy. Such a gift to be visited by my divine partner, mi amiga, Paloma Blanca. Shari Goodwin is a business strategist, leadership coach, speaker, and author of the Amazon best seller, Take the Reins! 7 Secrets to Inspired Leadership. She lives on a farm in Virginia with her husband, three dogs, and five horses.